Becca Bit and Can We Make it a Date? Oh blog friends, I had not intended to be gone for so long but I’ve been so busy behind the scenes. Today I have a Becca Bit for you and some news – in fact, I hope we can make it a date!! As you know every June/July new craft products start to roll out in anticipation of CHA. That’s when I get kind of quiet with the new things I’m designing behind the scenes. 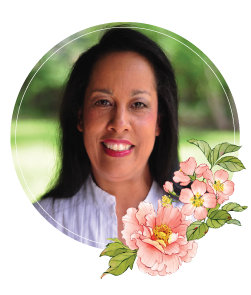 Well, it’s time again for Blog Frenzy and I’m so excited!!! It starts on June 21st which is tomorrow but I can just tell you this little secret, I’m in Central Time Zone so my post will go live tonite at 11pm. There are tons of new die templates to see and the contest is going to be awesome this go around!! So, please come back around midnight so that you can get your name in the drawing and be prepared to be totally enabled!! Now, on to a Becca Bit I’ve been trying to share for a while. Since I’ve managed to collect all the Distress Inks, I was so intrigued by the nibs you can use to apply color. Once I got rolling with it, I decided to get enough nibs for one per color and of course I needed some way to store them. Just recently I purchased the nib holder to go along with the nibs and I really like this set up. I simply used one of my clear cases and cut clear acetate to fit into both sides of the case and put a piece of double sided tape down the front on top of the acetate. On the underside of the acetate I put listing of the colors with enough space in between each that the nib could be stored with the color. I have a piece of wax paper that is cut to size – when I close the case, I simiply lay the wax paper in so that none of the nibs touch, if they are still a little moist they won’t affect each other and to keep the tape on one side from sticking to another. This is a card I did several months ago that was colored using the nibs – I love the control and the way the nib handles the pigment from the reinker so I thought I’d share. You can find the original post for the card along with the product list HERE. Thanks so much for stopping by, I’m so eager to hear what you think of what I have to show tomorrow!! Ohhh, Becca, I cannot WAIT to see what’s coming from you tomorrow — you’re such a tease!!! ;~) Sooo, 11 PM your time is 9 PM my time (I think?) since we rebels here in AZ don’t go on DST! PERFECT, I’ll be stalking you tonight!!! I sure have missed your posts but figured you were working on all the new stuff that will be coming. Gorgeous card and thank you for the great Becca bit tips. Where did you get the nib holder and the nibs? 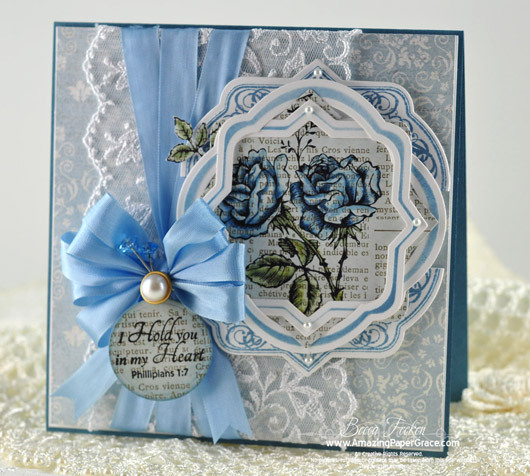 I just love that card….in fact I love just about every card that you make as they are so beautiful and elegant! Cannot wait to see what is planned! What is holding the nibs in place…can’t tell from the picture – slots to slide them in??? I get the waxed paper sheet to keep colors from touching…maybe a tutorial on exactly how you use the nibs and also a bit more on the nibs, holder and where to get them…pretty please! I wondered where you had got to glad you’re back missed your lovely cards. As usual I am behind the times and know nothing about these nibs…*sigh* but I really love the control you have using them as exhibited in your card! 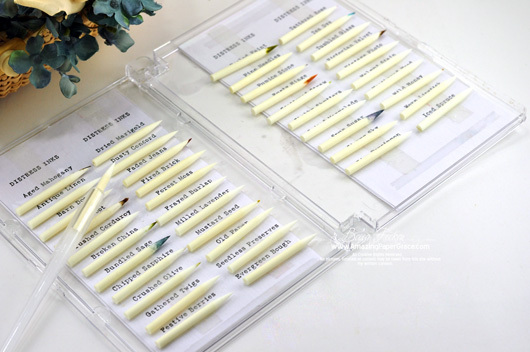 OK, so I have to go on a quest for these nibs…and of course I love your storage idea! I probably need to collect a few more re-inkers as I am sure I don’t have all my fav colors yet! LOL! Is there ever a point that we are satisfied?! I guess that the new discoveries are half the fun of our art! Great idea, Becca. I’m saving up for some of those cases but I can’t afford 200 at one crack so I need to find some crafting buddies to share an order. I keep my Distress Ink Pads stored upside down in drawers that are just deep enough to stack them two high along with my homemade foam pad holders (also stamped with the name and color it belongs to) resting on top of them. I keep certain color families together and stamp an image on the bottom of each case with the color contained inside. Since they are upside down, you see the color first thing. I have had to refresh them occasionally but I do all of my ink pads this way… upside down with the color stamped on the bottom of the container. I’ve missed you! Like you, I am coloring challenged. A tutorial on coloring with inks and nibs would be appreciated. In your nib storage, do you run a row of double sided-tape on the acrylic so the nibs stay in place and don’t roll around when you close the case? Love the nib storage idea. You didn’t specify how the nibs stay in place tho. Did you use double sided tape? When I first read your Becca Bit and saw the picture, I thought you bought the item, but on the second read, I got it that you made this..just wasn’t sure about the attaching of the nibs. Thank you for all of your great organization tips. You are a blessing in so many ways. thank you , thank you for the idea. I use nibs a lot for blending and coloring. Question? could you give us tutorial on just how you put this together. Right now I have mine in a cup. thank you so much. What a great tip. I love the card you did. This card is totally fantastic. I just bought some lace like that and my next card will be using it. I have a birthday card to make for two of my cardmaking buddies, one June 30 and one the same day as mine, July 9. Glad to hear you have just been busy and nothing else wrong. Love your ingenuity and creativeness. God Bless! Oh I must check out those nibs, I had not even heard of them. Lovely card! I can hardly wait to check out your site later this evening!!! 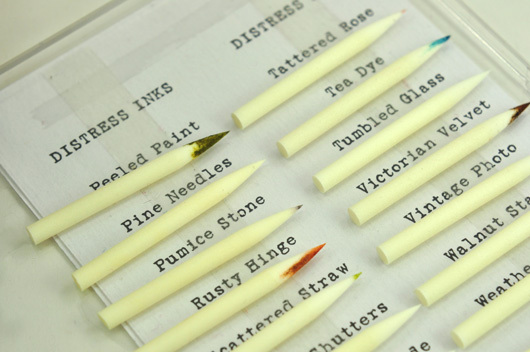 What a great tip for Distress Ink and tips! Your blog is just awesome, what a kind hearted person you are! Can’t wait to see what you have for us tomorrow. I had already thought of that way to store my nibs also, but I could not figure out a way to keep them in place when I closed the case in order for them to not run all over. But I have doubts about the wax paper, do the wax paper protects them or do you use something else in order for them to stick down? I would also like for you to tell me how do you think they work best dry or wet? Thanks for all the help and keep inspiring us with your awesome talent! Wondered where you had got to ,this card is really lovely blue makes it stand out ! Thanks for the great organizational tip. I have a few distress ink pads, but no nibs. This looks like a great idea for storing them! I don’t know those kind of nib and how to use it. Beautiful card and cannot wait 11 tonight. So happy to see you back. MISSED your inspiration. The storage idea is super & so useful. Where did you get the nib holder and the nibs? I would love a tutorial on using them. Have a super visit in Central Time, can’t wait for you to be home & creating again. Becca – thanks for your post. Excited for the blog frenzy from Spellbinders and to see what incredible projects you have come up with once again. 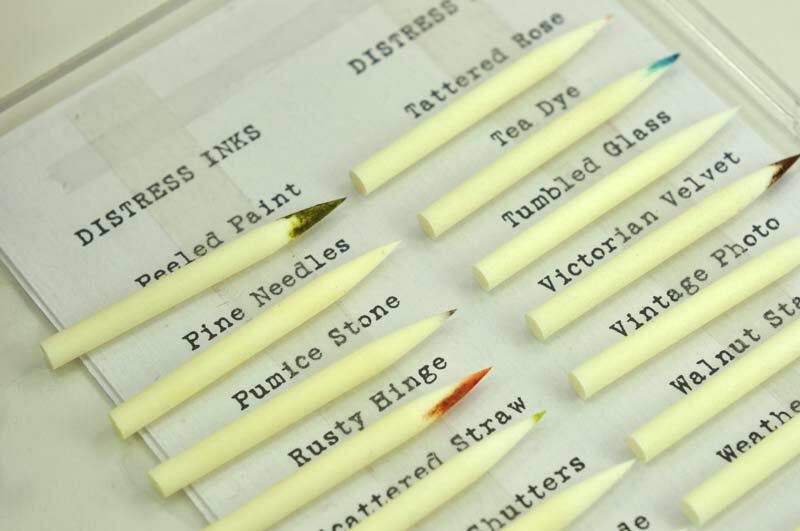 Are the nibs for the water pen that you use with the new Tim Holtz distress markers? I am not sure? I don’t have these yet but I believe I saw a video showing how to color using a water pen with an interchangeable nib? Wow, what a spectacular card, think it is one of my favorites of all time so far from you, love all you do, but this one is just stunning. Love the new dies and the hop ends on my birthday, maybe I will be lucky enought to wina present for myself, and boy what a present, I love my spell binders, wish i could afford them all!!! Thanks for all your wonderful inspiration!! Where can I purchase the nibs? Have not seen them at the craft store. sharing your work and ideas. Your work is breathtaking and your vedios so informative.